The first was Lucien Conein, a legendary CIA operative whose covert career ranged from parachuting into North Vietnam in 1945 to train communist guerrillas with Ho Chi Minh to organizing the CIA coup that killed South Vietnamese President Ngo Dinh Diem in 1963. In the course of our interview at his modest home near CIA headquarters in Langley, Virginia, he laid out just how the agency’s operatives, like so many Corsican gangsters, practiced the “clandestine arts” of conducting complex operations beyond the bounds of civil society and how such arts were, in fact, the heart and soul of both covert operations and the drug trade. My last mentor on the subject of drugs was Tom Tripodi, a covert operative who trained Cuban exiles in Florida for the CIA’s 1961 Bay of Pigs invasion and then, in the late 1970s, penetrated mafia networks in Sicily for the US Drug Enforcement Administration. In 1971, he appeared at my front door in New Haven, Connecticut, identified himself as a senior agent for the Treasury Department’s Bureau of Narcotics, and insisted that the bureau was worried about my future book. Rather tentatively, I showed him just a few draft pages of my manuscript for The Politics of Heroin, and he promptly offered to help me make it as accurate as possible. During later visits, I would hand him chapters, and he would sit in a rocking chair, shirtsleeves rolled up, revolver in his shoulder holster, scribbling corrections and telling remarkable stories about the drug trade—like the time his bureau found that French intelligence was protecting the Corsican syndicates smuggling heroin into New York City. Far more important, though, through him I grasped how ad hoc alliances between criminal traffickers and the CIA regularly helped both the agency and the drug trade prosper. Looking back, I can now see how those veteran operatives were describing to me a clandestine political domain, a covert netherworld in which government agents, military men, and drug traders were freed from the shackles of civil society and empowered to form secret armies, overthrow governments, and even, perhaps, kill a foreign president. At its core, this netherworld was then and is today an invisible political realm inhabited by criminal actors and practitioners of Conein’s “clandestine arts.” Offering some sense of the scale of this social milieu, in 1997 the United Nations reported that transnational crime syndicates had 3.3 million members worldwide who trafficked in drugs, arms, humans, and endangered species. Meanwhile, during the Cold War, all the major powers—Britain, France, the Soviet Union, and the United States—deployed expanded clandestine services worldwide, making covert operations a central facet of geopolitical power. The end of the Cold War has in no way changed this reality. For over a century now, states and empires have used their expanding powers for moral prohibition campaigns that have periodically transformed alcohol, gambling, tobacco, and above all, drugs into an illicit commerce that generates sufficient cash to sustain covert netherworlds. The influence of illicit drugs on US foreign policy was evident between 1979 and 2019 in the abysmal failure of its never-ending wars in Afghanistan. Over that period, two US interventions there fostered all the conditions for just such a covert netherworld. While mobilizing Islamic fundamentalists to fight the Soviet occupation of that country in the 1980s, the CIA tolerated opium trafficking by its Afghan mujahedeen allies while arming them for a guerrilla war that would ravage the countryside, destroying conventional agriculture and herding. In the decade after superpower intervention ended in 1989, a devastating civil war and then Taliban rule only increased the country’s dependence upon drugs, raising opium production from 250 tons in 1979 to 4,600 tons by 1999. 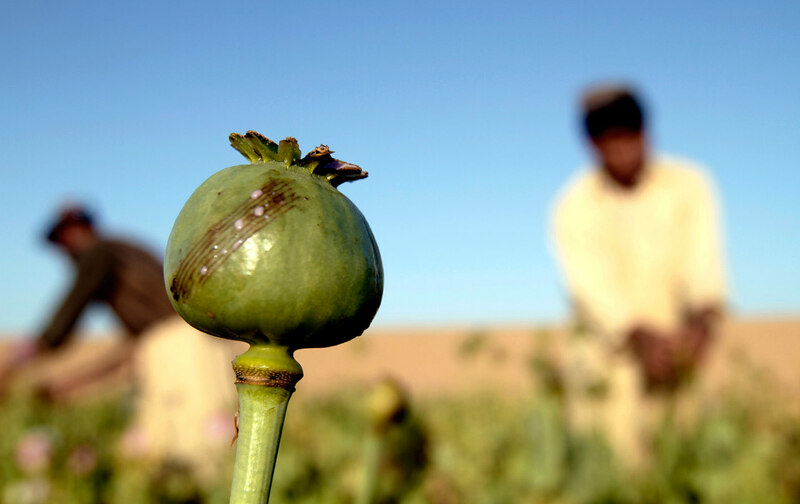 This nearly 20-fold increase transformed Afghanistan from a diverse agricultural economy into a country with the world’s first opium monocrop—that is, a land thoroughly dependent on illicit drugs for exports, employment, and taxes. Demonstrating that dependence, in 2000, when the Taliban banned opium in a bid for diplomatic recognition and cut production to just 185 tons, the rural economy imploded and their regime collapsed as the first US bombs fell in October 2001. To say the least, the US invasion and occupation of 2001–02 failed to effectively deal with the drug situation in the country. As a start, to capture the Taliban-controlled capital, Kabul, the CIA mobilized Northern Alliance leaders who had long dominated the drug trade in northeastern Afghanistan, as well as Pashtun warlords active as drug smugglers in the southeastern part of the country. In the process, they created a postwar politics ideal for the expansion of opium cultivation. Even though output surged in the first three years of the US occupation, Washington remained uninterested, resisting anything that might weaken military operations against Taliban guerrillas. Testifying to this policy’s failure, the UN’s Afghanistan Opium Survey 2007 reported that the harvest that year reached a record 8,200 tons, generating 53 percent of the country’s gross domestic product and accounting for 93 percent of the world’s illicit narcotics supply. When a single commodity represents over half of a nation’s economy, everyone—officials, rebels, merchants, and traffickers—is directly or indirectly implicated. In 2016, The New York Times reported that both Taliban rebels and provincial officials opposing them were locked in a struggle for control of the lucrative drug traffic in Helmand province, the source of nearly half the country’s opium. A year later, the harvest reached a record 9,000 tons, which, according to the US command, provided 60 percent of the Taliban’s funding. Desperate to cut that funding, American commanders dispatched F-22 fighters and B-52 bombers to destroy the insurgency’s heroin laboratories in Helmand—doing inconsequential damage to a handful of crude labs and revealing the impotence of even the most powerful weaponry against the social power of the covert drug netherworld. With unchecked opium production sustaining Taliban resistance for the past 17 years and capable of doing so for another 17, the only US exit strategy now seems to be restoring those rebels to power in a coalition government—a policy tantamount to conceding defeat in its longest military intervention and least successful drug war. For the past half-century, the ever-failing US drug war has found a compliant handmaiden at the UN, whose dubious role when it comes to drug policy stands in stark contrast to its positive work on issues like climate change and peacekeeping. In 1997, the director of UN drug control, Pino Arlacchi, proclaimed a 10-year program to eradicate illicit opium and coca cultivation from the face of the planet, starting in Afghanistan. In 2007, his successor, Antonio Maria Costa, glossing over that failure, announced in the UN’s World Drug Report that “drug control is working and the world drug problem is being contained.” While UN leaders were making such grandiloquent promises about drug prohibition, the world’s illicit-opium production was, in fact, rising almost ninefold, from just 1,200 tons in 1971, the year the US drug war officially started, to a record 10,500 tons by 2017. This gap between triumphal rhetoric and dismal reality cries out for an explanation. That ninefold increase in illicit opium supply is the result of a market dynamic I’ve termed the stimulus of prohibition. At the most basic level, prohibition is the necessary condition for the global narcotics trade, creating both local drug lords and transnational syndicates that control this vast commerce. Prohibition, of course, guarantees the existence and well-being of such criminal syndicates, which, to evade interdiction, constantly shift and build up their smuggling routes, hierarchies, and mechanisms, encouraging a worldwide proliferation of trafficking and consumption while ensuring that the drug netherworld will only grow. In seeking to prohibit addictive drugs, US and UN drug warriors act as if mobilizing for forceful repression could reduce drug trafficking, thanks to the imagined inelasticity of or limits on the global narcotics supply. In practice, however, when suppression reduces the opium supply from one area (for example, Burma or Thailand), the global price just rises, spurring traders and growers to sell off stocks, old growers to plant more, and other areas (say, Colombia) to enter production. In addition, such repression usually only increases consumption. If drug seizures, for instance, raise the street price, then addicted consumers will maintain their habit by cutting other expenses (food, rent) or raising their income by dealing drugs to new users and so expanding the trade. Instead of reducing the traffic, the drug war has actually helped stimulate that ninefold increase in global opium production and a parallel surge in US heroin users, from just 68,000 in 1970 to 886,000 in 2017. By attacking supply and failing to treat demand, the UN-US drug war has been pursuing a “solution” to drugs that defies the immutable law of supply and demand. As a result, Washington’s drug war has, in the past 50 years, gone from defeat to debacle. That drug war has, however, incredible staying power. It has persisted despite decades of failure because of an underlying partisan logic. In 1973, while President Richard Nixon was still fighting his drug war in Turkey and Thailand, New York’s Republican governor, Nelson Rockefeller, enacted the notorious Rockefeller drug laws. Those included mandatory penalties of 15 years to life for the possession of just four ounces of narcotics. As the police swept inner-city streets for low-level offenders, prison sentences in New York State for drug crimes surged from only 470 in 1970 to a peak of 8,500 in 1999, with African Americans accounting for 90 percent of those incarcerated. By then, New York’s state prisons held a previously unimaginable 73,000 people. During the 1980s, President Ronald Reagan, a conservative Republican, dusted off Rockefeller’s anti-drug campaign for intensified domestic enforcement, calling for a “national crusade” against drugs and winning draconian federal penalties for personal drug use and small-scale dealing. For the previous 50 years, the US prison population remained remarkably stable at just 110 prisoners per 100,000 people. The new drug war, however, almost doubled those prisoners, from 370,000 in 1981 to 713,000 in 1989. Driven by Reagan-era drug laws and parallel state legislation, prison inmates soared to 2.3 million by 2008, raising the country’s incarceration rate to an extraordinary 751 prisoners per 100,000 population. And 51 percent of those in federal penitentiaries were there for drug offenses. Such mass incarceration has led as well to significant disenfranchisement, starting a trend that would, by 2012, deny the vote to nearly 6 million people, including 8 percent of all African-American voting-age adults, a constituency that had gone overwhelmingly Democratic for more than half a century. In addition, this carceral regime concentrated its prison populations, including guards and other prison workers, in conservative rural districts of the country, creating something akin to latter-day rotten boroughs for the Republican Party. So successful were Reagan Republicans in framing this partisan drug policy as a moral imperative that two of his liberal Democratic successors, Bill Clinton and Barack Obama, avoided any serious reform of it. Instead of systemic change, Obama offered clemency to about 1,700 convicts, an insignificant handful among the hundreds of thousands still locked up for nonviolent drug offenses. While partisan paralysis at the federal level has blocked change, the states, forced to bear the rising costs of incarceration, have slowly begun reducing prison populations. In a November 2018 ballot measure, for instance, Florida—where the 2000 presidential election was decided by just 537 ballots—voted to restore electoral rights to the state’s 1.4 million felons, including 400,000 African Americans. No sooner did that plebiscite pass, however, than Florida’s Republican legislators desperately tried to claw back that defeat by requiring that those felons pay fines and court costs before returning to the electoral rolls. Not only does the drug war influence US politics in all sorts of negative ways, but it has also reshaped American society—and not for the better. The surprising role of illicit-drug distribution in ordering life inside some of the country’s major cities has been illuminated in a careful study by a University of Chicago researcher who gained access to the financial records of a drug gang inside Chicago’s impoverished Southside housing projects. He found that in 2005 the Black Gangster Disciple Nation, known as GD, had about 120 bosses who employed 5,300 young men, largely as street dealers, and had an additional 20,000 members aspiring to those jobs. While the boss of each of the gang’s hundred crews earned about $100,000 annually, his three officers made just $7.00 an hour, and his 50 street dealers only $3.30 an hour, with other members serving as unpaid apprentices, vying for entry-level slots when street dealers were killed, a fate which one in four regularly suffered. So what does all this mean? In an impoverished inner city with very limited job opportunities, this drug gang provided high-mortality employment on a par with the minimum wage (then $5.15 an hour) that their peers in more affluent neighborhoods earned from much safer work at McDonald’s. Moreover, with some 25,000 members in Southside Chicago, GD was providing social order for young men in the volatile 16-to-30 age cohort—minimizing random violence, reducing petty crime, and helping Chicago maintain its gloss as a world-class business center. Until there is sufficient education and employment in the nation’s cities, the illicit drug market will continue to fill the void with work that carries a high cost in violence, addiction, imprisonment, and more generally blighted lives. As the global prohibition effort enters its second century, we are witnessing two countervailing trends. The very idea of a prohibition regime has reached a crescendo of dead-end violence not just in Afghanistan but recently in Southeast Asia, demonstrating the failure of the drug war’s repression strategy. In 2003, Thai Prime Minister Thaksin Shinawatra launched a campaign against methamphetamine abuse that prompted his police to carry out 2,275 extrajudicial killings in just three months. Carrying that coercive logic to its ultimate conclusion, on his first day as Philippine president in 2016, Rodrigo Duterte ordered an attack on drug trafficking that has since yielded 1.3 million surrenders by dealers and users, 86,000 arrests, and some 20,000 bodies dumped on city streets across the country. Yet drug use remains deeply rooted in the slums of Bangkok and Manila. On the other side of history’s ledger, the harm-reduction movement led by medical practitioners and community activists worldwide is slowly working to unravel the global prohibition regime. With a 1996 ballot measure, California voters, for instance, started a trend by legalizing medical-marijuana sales. By 2018, Oklahoma became the 30th state to legalize medical cannabis. After initiatives by Colorado and Washington in 2012, eight more states have decriminalized the recreational use of cannabis, long the most widespread of illicit drugs. Hit by a surge of heroin abuse during the 1980s, Portugal’s government first reacted with repression that, as everywhere else on the planet, did little to stanch rising drug abuse, crime, and infection. Gradually, a network of medical professionals across the country adopted harm-reduction measures that would provide a striking record of proven success. After two decades of this ad hoc trial, in 2001, Portugal decriminalized the possession of all illegal drugs, replacing incarceration with counseling and producing a sustained drop in HIV and hepatitis infections. Projecting this experience into the future, it seems likely that harm-reduction measures will be adopted progressively at local and national levels around the globe as various endless and unsuccessful wars on drugs are curtailed or abandoned. Perhaps someday a caucus of Republican legislators in some oak-paneled Washington conference room and a choir of UN bureaucrats in their glass-towered Vienna headquarters will remain the only apostles preaching the discredited gospel of drug prohibition.